This cake was made for our good friend Jamie. He turned the big 3-0 this week and we wanted to come up with something original for his cake. Jamie's a pretty original dude so it was important that his cake not be "generic." Rodney and Jamie used to be in a band together once upon, a long, long, long...well, you get the point. It was a while back. Rodney came up with the idea for this cake, the anti-cake. Jamie's a very outspoken, well read guy and this them suits him perfecly. 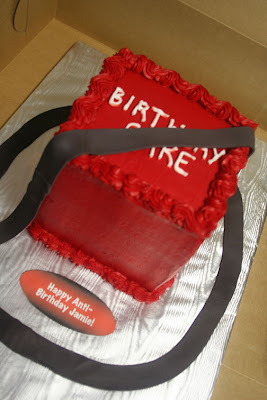 If you can't tell, it's supposed to be a "generic" birthday cake (hence the 'birthday cake' written on it) with the "against" sign laid on it. Get it? It's the anti-birthday cake! This cake is three layers of white cake with strawberries and vanilla buttercream sandwiched in between! The against sign was made with marshmallow fondant! That's funny. You guys are so creative.